Recognized as one of America’s Most Challenging High Schools by the Washington Post. Designated for the second time as a National Association of Secondary School Principals “Breakthrough School” – selected for high academic achievement while serving large numbers of students living in poverty. Learn more about Preuss and its achievements. Tran’s AP U.S. History teacher, Chellyn Boquiren, feels the same way. Boquiren was one of 12 educators in the country named a Bezos Scholar and will be participating in the program with Tran. “This is an opportunity for me to reflect on my goals as an educator and think about how Eric and I will share what we learn,” said Boquiren, who also teaches a class on western civilization at Preuss, a charter middle and high school for low-income students who strive to become the first in their families to graduate from college. “I’m really looking forward to interacting with and learning from other educators,” she added. Founded in 2005, the Bezos Family Foundation annually selects rising seniors and their educators to participate in the yearlong Bezos Scholars program. Scholars are selected based on demonstrated leadership abilities, willingness to embrace learning for learning’s sake, and the desire to create lasting change in their communities. The program begins with an all-expenses paid trip to the Aspen Ideas Festival in Colorado this summer. At the festival, the U.S. scholars will meet with six Bezos Scholars selected from the African Leadership Academy in South Africa as well as with visionaries, leaders and artists from around the globe. Scholars will participate in a variety of seminars, plenary sessions and informal meetings where they will have the opportunity to share their ideas and ask questions. After attending the Festival, scholars return home to organize their own community change projects know as Local Ideas Festivals. This is the third time since the program’s inception that a Preuss student and educator have been named Bezos Scholars. Previous scholars had been named in 2009 and 2010. “It was an incredible experience,” said Preuss principal Scott Barton, who participated in the 2009 program. Barton recalls sharing a private breakfast with retired Supreme Court Justice Sandra Day O’Connor as one of the highlights of his time at the festival. While Tran doesn’t have all the details of his community project figured out, he knows that he wants to create a tutoring and mentoring program for neighborhood youth. The goal, he says, would be to keep youth motivated in school and help them make the right choices outside the classroom as well. He is eager to learn from Aspen Ideas Festival attendees and apply their wisdom and experience to his project as well as his own life. 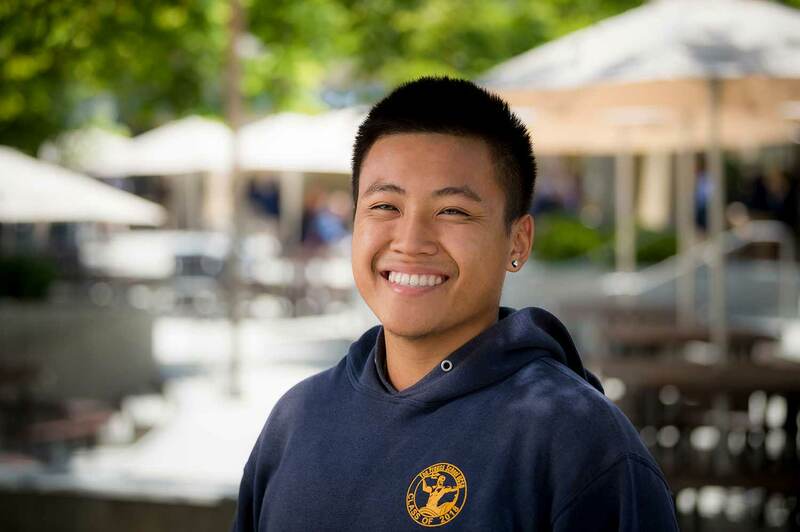 “I want to give youth like me an opportunity to reach the same level of success that I have been able to enjoy,” said Tran, who credits Preuss with providing him with all the resources he will ever need to be successful.